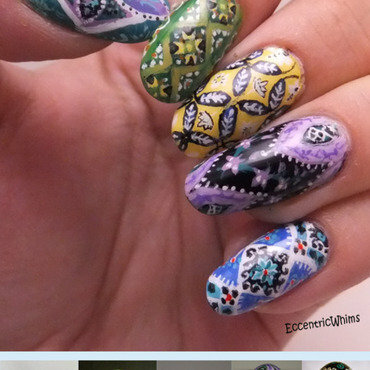 I first picked up nail polish as a hobby in late 2012. Since then, it's become a fun obsession! 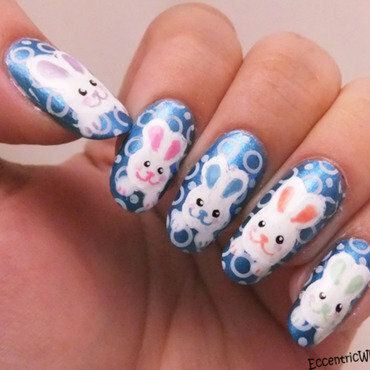 I really like the intricacies of traditional Easter eggs, so I tried to recreate them on my nails with a small brush. Tiny details are fun! I had lots of fun doodling cute and colorful bunnies! My first post to Nailpolis! I'm getting into holiday mode with some little yellow chicks today. 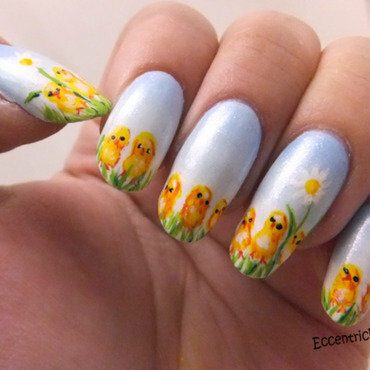 I sponged on a pastel blue to white gradient, then painted a row of tiny chicks with various yellows and oranges. It seemed a bit bare still, so I added some grass. Happy spring colors make me smile!